Tagged under Kairi Yura, Madhouse, Drama CD, Light Novel, Series. It's been half a year since the Emperor has succeeded the throne of Saiunkoku. He is young and seems to have little motivation or interest governing. Furthermore with no concubines to date he has earned a reputation of being interested more in men! There is no choice for a replacement since he is the sole heir to the throne. If things continue this way, it will only be a matter of time before some usurper will set their greedy eyes on the throne leading the country into another civil war when it has barely recovered from the last. When Grand Advisor Shou approaches Kou Shuurei with an offer she just could not refuse, Shuurei ends up becoming the concubine of the Emperor of Saiunkoku for three months, in hopes of generating an interest and motivation of his position over the country. - Bunkobons written by Sai Yukino, illustrations by Kairi Yura (2003-2011); main stories (18 volumes), side stories (5 volumes). - Two TV Anime produced by Madhouse, 39 episodes each; 1st series (2006-2007), 2nd series (2007-2008). - Alternate Retelling Manga by Kairi Yura (2005-2012), 9 volumes. I start this section off by providing a link to a blogger's site about what they felt about this anime. I think the pictures and their captions tell it all and pretty well gives you the impression about what sort of large fan following will come to follow this show. With lots of eye candy and potential for coupling, it's enough to satisfy any fangirl. That being said, those who prefer a little more sophistication in their viewing will find it in this anime. Though the plot is nothing groundbreaking, there are life themes and concepts presented that are worth consideration. In particular, I quite liked the episode titles. This a great, cute story if you like reverse harem. The protagonist it's not dull with a bunch of bishounen swarming her, like some shoujo animes. You actually get interested in what happens in the story and how things are going to develop. It's also great for a period anime. The story is based on the Tang Dynasty of ancient China. It was one of the most prosperous dynasties in the long history of China. From the government structure to the fashion, all the details are carefully followed. The characters are all really well developed and I got to know all of them well and understand how they feel. The romance is brilliant. It is not overdone nor is it contrived. Each of Shuurei's suitors are unique and special. Beautiful artwork and the men are all eye-candies, but the original art in the novels is still better. Shuurei is another one of my heroes. She is hard-working and self-motivated. I like how she becomes more shrewd and not so naive as the story progresses. She is the kind of genius that isn't fed up with the world and always looks at the positive side of things. She really is an admirable person. When will it come out anyway? !...But there is surely a season 3 !!! I wonder what will Ryuuki and Shurei's bet turn out!!! This is a series that I really love .... beautiful characters, gorgeous scenary great story even if it is very long ...... the adventures of heroin Kou Shuurei are interesting and exciting from the point of view of history too.. advice everyone not to lose! 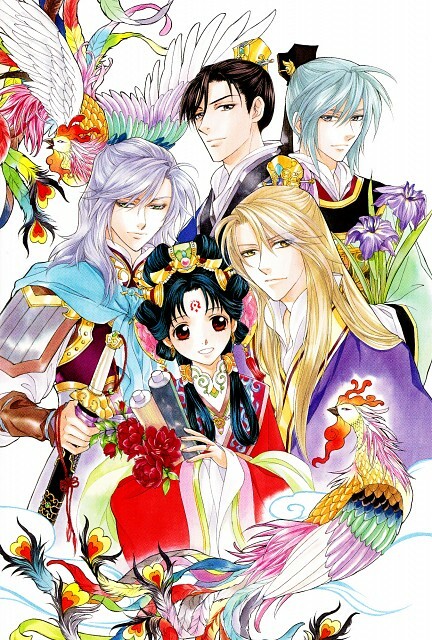 The storyline for this series is like the love child of Fushigi Yuugi and The Twelve Kingdoms. It had some great character development of Shuurei and a lovely musical score (OST) for the series. My favorite character would have to be Kouyou, love his non-sense of direction! This is another series that I wish had been continued as the novels give much more story than is presented in the anime. the anime was good, i really liked it. I'm now a political science major, and now that i look back on it, some aspects in the anime were right and was expressed in a simple way. the story was good. the plot was well interwoven. One thing i also liked about it the most is the art. The characters were well crafted, they actually looked really good. i liked in particular the personality of the heroine, though it was quite common. In all, the anime is good and is a must-watch. i think though that others might find it boring since it's political, but it's worth a watch. it's one of the animes that can inspire you, and also in which you can learn a lot of things, if you look deeper into it.. I love all of the politicalness (yes I know that's not a word) in this anime. Actually, it's how one of my friends got me to watch it in the first place. She knows I love politics, and that anything that looked too 'pink' I wouldn't go near. So she just started telling me a story line. Eventually I asked what it was because it sounded interesting, so here I am. Based on light novels. 1st season is much better than the 2nd; what a way to end the anime! I hope for a 3rd season, but it has to wait for material from the novels. It's shoujo without being overwhelming. Still, it's a reverse harem with lots of eye candy and fangirl opportunities. I cannot tell you how delightful this historical fiction anime this is. Even with it's unnecessary confusing terms it is such an entertaining anime to watch. With it's side relief characters such as Kouyuu (who is my favorite anime character of all time) and even Ryuuki who create side scenes that are amusing. Overall, the aesthetic design was that caught me most of all.